Tank Chassis Track Caterpillar Car Chassis Metal Tracked Crawler Robotic Toy for Robot Arduino DIY T300. Features: - Noveland elegant appearance; - Aluminum alloy; - Solid structure; - Powerful force; - Quickly, stability, flexibility; - Strong power; Set aside a variety of installation interface: - Inlcude installation port for Arduino UNO R3 - Port for NodeMCU WiFi development board - Port for 9g servo - Port for servo (like MG996R, MG995) - Port for machinacal arm - Preset two ports for light driving at night Specifications: - Name: T300 Intelligent track car/Caterpillar Car /tank chassis - Material: Aluminum alloy - Surface oxidation: Yes - Color: Silver - Track: Metal - Product size: about 290270100mm (length width height) - Weight: 1.6kg - Working load: 5kg Motor Parameters: - Name:25mm DC brushless motor with hall sensor encoder - Output speed: 150±10%rpm - No-load current: 200mA (Max) - Stall current: 4500mA(max) - Stall torque: 9.5kgNaN - Rated speed: 100±10%rpm - Rated torque: 3000gNaN - Rated current: 1200mA (Max) - Noise :56dB - Working voltage: 9V - Outside Shaft Length: 14.5mm - Shaft End Play: 0.05-0.50mm - Screw Size: M3.0 - Dia. Of Shaft phi 4mm, D3.5 - Encoder: 2pulses/circle Package List: - Tank Chassis:1 pcs - Driving wheels: 2 pcs - Bearing wheels: 10 pcs - Track:2 pcs (can be changed the length) - DC motor with hall sensor: 2 pcs - Screws. Or unpaid dispute will be filed for non-payer after 7 days of sales day. If you receive defective item, please kindly notify us within 14 days. 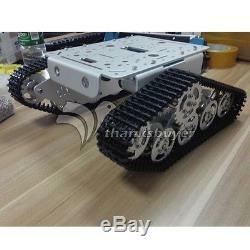 The item "Tank Track Caterpillar Car Chassis Metal Tracked Crawler Robotic for DIY T300" is in sale since Friday, October 28, 2016. This item is in the category "Business & Industrial\Automation, Motors & Drives\Industrial Robotic Arms". The seller is "thanksbuyer-hobby" and is located in Shenzhen. This item can be shipped worldwide.